I decided to tackle answering the question “How much do bloggers make” by compiling all of the available information I could find and analyzing it. To do this, I scoured the web for bloggers who self-reported their earnings. I looked for any available surveys that analyzed blog income. I hunted down research that attempted to shed light on blogger’s income. This article, which I intend to regularly update, is the result of that effort. So read on to gain some insight into how much money bloggers make. Bloggers who self-report their income seems to be a trend recently – which was probably started/influenced by Pat Flynn and his detailed monthly reports on SmartPassiveIncome.com. 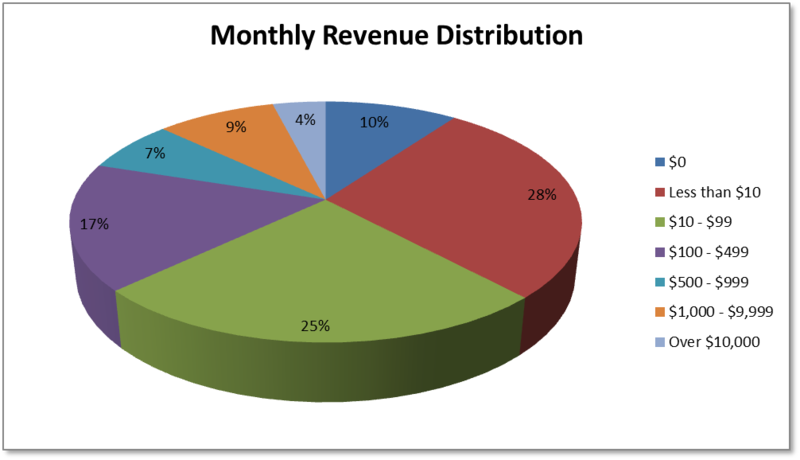 In the table below, I compiled a list of 50 bloggers who self-reported monthly revenue more than $1,000. Note(s): The columns are sortable. I’ve displayed the first 25 in alphabetical order. You can view all 50 by selecting “Show 50 entries” or select “Next” below the table. Not all of the sites listed are traditional “blogs”. For example, some of the entrepreneurs make their money by selling products through the Amazon FBA program. I still decided to list them since they are earning their income online. On some sites the reported revenue included revenue from providing consulting or freelancing services. I decided to include these sites under the presumption that their blogs were directly responsible for their consulting/freelancing revenue. This may not always be the case. Not all bloggers reported their expenses, so I didn’t calculate a profit number for them. If you want to be included in the table, please leave a comment or contact me via twitter. In 2008 I started creating some websites as more of a hobby. Soon after my first websites were alive, I decided to see if they could make any money, just for fun. In January 2009 I earned a whopping $8.96 from my sites…but I was excited. My goal for 2009 was to earn enough from my sites to buy my lunch daily. By the end of 2009, my sites were earning over $500 per month. As the income began to climb, I got more and more serious about it. By the end of 2012, my sites were earning more than $8,000 per month – and I was still doing it as a side business on nights and weekends. In 2013 my business exploded and I was regularly earning over $30,000 per month. In July 2013 I quit my full time job to focus on my online business…and haven’t looked back. In the “50 Bloggers” table above I have listed the revenue and expenses from my top niche site (listed under Start Grow Profit (top niche site)). I’ve shown you 50 bloggers who earn over $1,000 per month. I’ve also told you how I grew my own business to over $30,000 per month. What I haven’t told you, yet, is what an “average” blogger earns. Determining “average blog earnings” is a complicated problem. There are hundreds of millions of blogs. There are currently more than 75 million blogs running WordPress (either self-hosted or hosted on WordPress.com). There are now over 200 million blogs on Tumblr. Personal – blogging for fun or personal reflections. Purpose is not to make money. Corporate – runs a blog for a company or brand. Varied purposes for the blogs, but not intended to make money for the person running the blog. Part-timer/hobbyist – runs a blog as a side job. Interested in making some money on their blog. Entrepreneur – Trying to make their living off of their blog. A study by Zig Marketing claims that generating revenue was the primary reason for blogging for only about one in four bloggers. 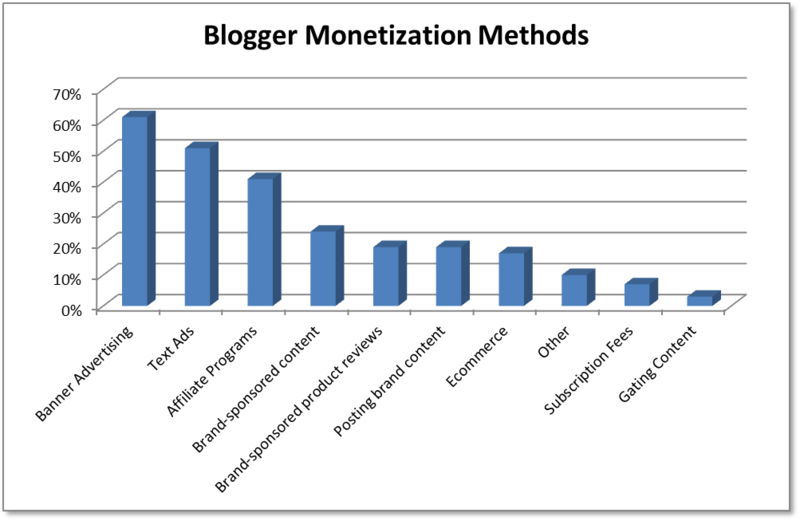 So any stats that you see about what bloggers earn can be clouded by the purpose of the blog as well as the blogger’s commitment to monetization. Another factor that influences what bloggers earn is their niche. Wpromote’s list of popular blog categories shows the incredible diversity of blog topics. As you can imagine, some niches monetize much better than others. 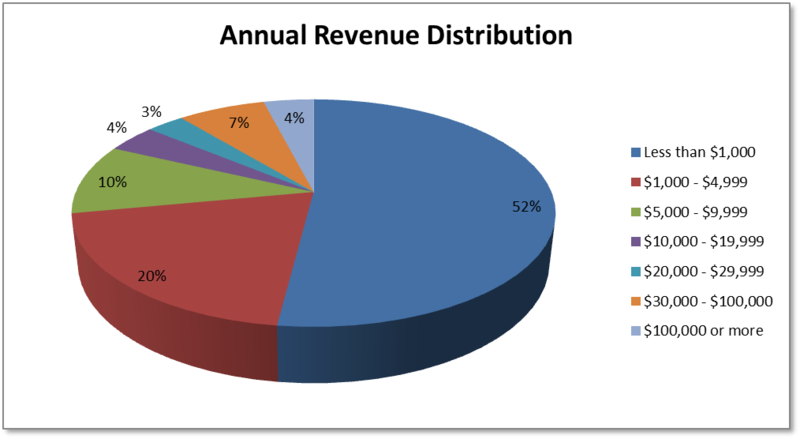 All these caveats aside, the following studies shed some light on the distribution of blogger’s earnings. Surveyed “influencers”… Approximately two-thirds of the influencers who they surveyed stated that they make money from blogging (but it might not be their primary purpose). As the table below shows, over 50% of the bloggers stated that they made less than $1,000 per year. The good news is that 11% of the bloggers made more than $30,000 a year. 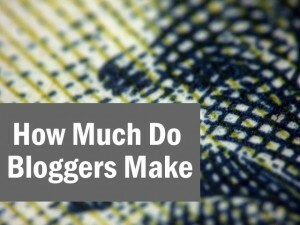 In late 2012, 1508 readers of ProBlogger were surveyed about their blog earnings. For the bloggers who attempted to make money, their monthly earnings breakdown is shown below. According to both of these (somewhat limited) studies, approximately 50% of bloggers earn less than $1,000 per year. While this may seem low, you need to remember that not all of these bloggers were interested in generating revenue or committed to growing/maintaining their blogs. The good news is that top bloggers can earn well in excess of $100.000 per year. Bloggers can earn money in a myriad of ways. The following techniques are some of the more popular ways that a blogger can generate revenue from their site. Advertising – Selling advertising has been a long time source of income for many bloggers. Bloggers can choose to use ad networks or sell ads directly themselves. The most popular ad network is Google’s AdSense program which allows bloggers to easily place either text or display ads in a myriad of formats and sizes. Affiliates – Bloggers can earn money on their blogs by recommending third party products in hopes of receiving an affiliate commission if one of their readers but the product/service. Affiliate networks provide a marketplace to bring affiliate advertisers and publishers together. The affiliate network provides the tracking code for the publisher to place on their site as well as providing all of the supporting infrastructure for tracking and reporting on the sales. eBooks/Information Products – Some bloggers create their own eBooks or other digital information products (e.g., training courses, videos, etc.). Selling these digital products can provide a high margin revenue stream for the blogger, but requires more infrastructure and customer support. Amazon FBA – Amazon has a Fulfillment-By-Amazon (FBA) program that manages all of the logistics of fulfillment, including displaying the products on Amazon.com, pick/pack/ship, and customer support. To make money via Amazon FBA, entrepreneurs buy products and ship them to Amazon. Amazon displays the products for sale (identified by a “Fulfillment by Amazon” tag). When the product is sold, Amazon takes care of everything. While not necessarily an opportunity for traditional blogs, Amazon FBA represents a real opportunity for those interested in making money online. Subscriptions – Bloggers can offer subscription or membership services to their customers. These subscriptions are typically for information-related content such as access to an online forum, monthly newsletters, or a continually updated area of their website. Subscription services provide a recurring revenue stream for the blogger but only work for niches with constantly changing dynamics. Job Boards – Bloggers can make revenue on their site by posting job listings on a Job Board. Bloggers can either maintain their own job board or integrate a third party provider like indeed.com or SimplyHired. Sponsored Content – Sponsored content traditionally refers to when an advertiser pays a publisher to have its brand associated with a story. Sponsored content can also refer to “promoted discovery” types of advertisements that often appear on the bottom of a page or sidebar under the title of “Around the Web” or something similar. Email Marketing – Email marketing is more of a marketing method than a monetization method. By building up a list of opt-in subscribers, bloggers can earn income by promoting affiliate offers or driving readers back to their blogs. Flipping Websites – Some entrepreneurs earn revenue by purchasing existing websites, improving them, and then reselling them at a profit. Pay Per Lead – In certain industries (such as education, insurance, financial services etc.) leads are very valuable. Bloggers can earn income by capturing these leads and selling them to interested companies. You can find out more about these monetization methods on my How To Make Money Blogging post. According to the Technorati survey, the top sources of revenue on blogs were advertising, affiliate programs, sponsored content, and sponsored product reviews. How Do You Make Money on Your Blog? As a relatively new blogger I must say I found your site really informative and full of rich content. Your blog certainly seems to be a ‘benchmark’ that many can aspire to (especially me)! It’s good to see you profiling those of us who sell online on venues like Amazon FBA and eBay. Usually when I think of bloggers making money, the first thing that comes to mind is affiliate income followed by someone that owns and promotes their own product. I’ve dabbled in both of these methods, but I’ve found that re-selling physical products on 3rd party websites has produced the most consistent income for me when it comes to making money online. I haven’t played around with Amazon FBA…but people are definitely making money with it! Thanks for including my post in your round up! Tons of great info in here and always amazing to see how well some bloggers are really doing! Thanks Vicky! Keep up the good work. By the way, I may have to try your Golden Berry Granola Bars recipe…they look delicious! Wow, great article and thanks for the kind words and mention…I am honored! Thanks John. I know you’ve inspired me and others with your successful journey! Wow great article. Really nice to see it in perspective of what it takes to start earning $1000+/month. Thanks for sharing! Thanks Akeel. Definitely puts it in perspective. No problem Tish. Keep up the good work! Thanks Larry. Keep up the good work. 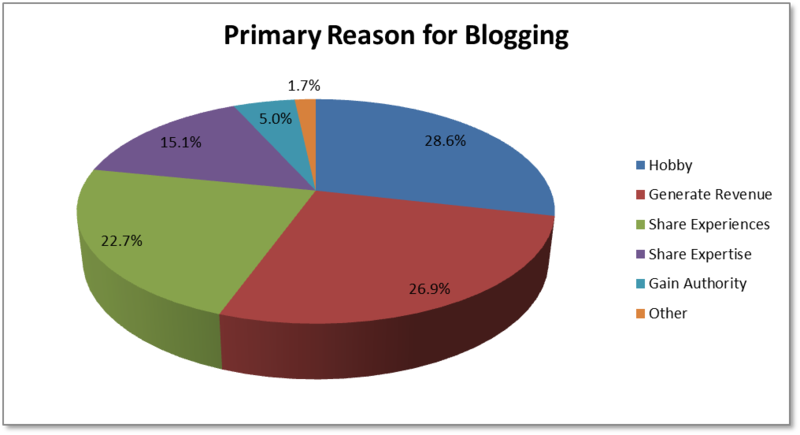 Thanks for such a detailed and resourceful post of the income of bloggers…. It would be interesting if maybe we could have another post on How Bloggers intent to earn in future…. With everything going mobile these days, the sources of income generation may also change..
Good point. On one of my niche sites, the mobile traffic is 41% of total, up from 26% 1 year ago. Sounds like a good idea for a follow up post. Amazing, thanks for mentioning me! The article is very interesting, I’m sure you can help lots of people getting real about making money online. I’m actually running a network of acquired websites. My blog talks about travel and lifestyle, but my other websites are in very different niches…. from DIY to job boards, a WordPress theme or a blog for Network Engineers…. all of them acquired. I really believe in buying existing web properties vs starting from 0. Are there other people interested in website acquisition here? Thanks for the updates about your business. I’ll update the chart accordingly. I’ve looked into website acquisition but haven’t pulled the trigger. It’s tricky and indeed there are many scams. It takes time to learn how to properly do a due diligence and website evaluation… but on the other side you cut the initial time investment on having to find a niche and try to make any money out of it. I have a couple blogs and several small niche websites, and I barely make $100 a month (sometimes not even that). I use both AdSense and Amazon affiliate, and my reviews of products (with aff links to Amazon), earn me way more than AdSense…like 20x more. I’ve been doing this for a couple years, and I just cannot fathom people making $30k+. That just floors me. As a new blogger I must say I found your site not only informative but also impressive and full of quality content. It’s really motivating to see that bloggers earn so much and this shows that we have a bright future ahead if we go in a right path. Your blog certainly seems to be a ‘benchmark’ that many can aspire to! Hoping to be that list soon!